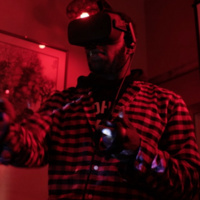 The Red Room Project is an artist portrait and 360 VR music documentary following the evolution of Oakland-based rap artist Shane Lassiter, aka Shino Smoke who has matured in his craft after migrating from his home in Sacramento to the artist enclave of Oakland. Shino finds inspiration, connectedness, and healing in his Red Room from the trauma of violence and tragedies in his artist community like the Ghost Ship Fire in Oakland. The 360 immersive experience of the film will be viewed at the "The Red Room Project" multimedia event, created by Shino Smoke in collaboration with Ina Adele Ray and Noam Eshel in 2018. In this video you will visit Shane and be a part of his world and his hip-hop and artist community in Oakland, CA.